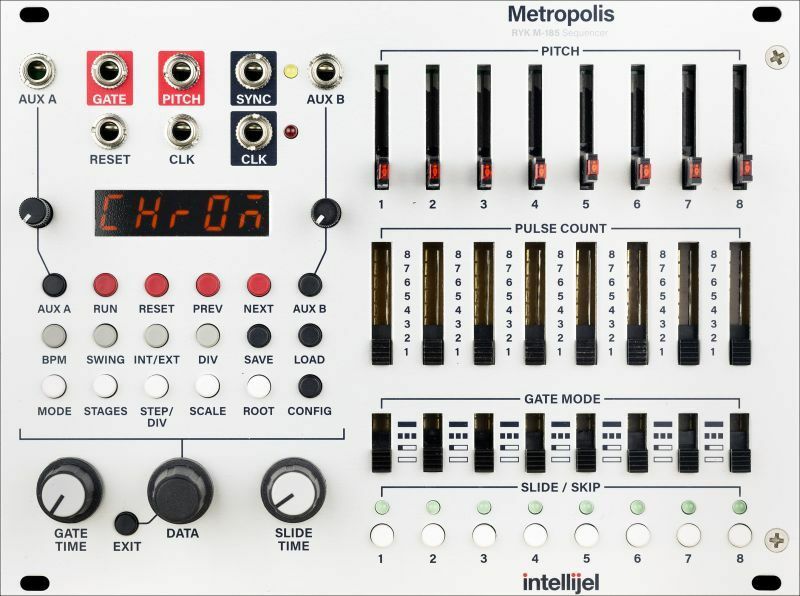 The Metropolis is a unique and powerful musical sequencer inspired by the Ryk M-185 (a Roland System 100m format sequencer.) but with many additional enhancements and functions. The Metropolis comprises eight “STAGES”, each with its own assignable gate mode, pulse count and pitch value. Each stage can also have a special slide or skip function activated too. The slide functionality is a constant time portamento very similar to the Roland TB303 (unlike most synths/sequencers that use constant rate portamento) which produces a very musical and interesting result. In addition to the base sequencer settings set with the sliders and switches there is a full menu of controls and auxiliary modifiers that allows the user to control and manipulate the sequence in many powerful ways including sequencer direction modes, pitch quantization and scale manipulators, clock dividers, shuffle and much more. Two assignable AUX inputs which can control: gate length, transpose, key shift, root shift, sequence length, step divisor and octave offset. WARNING! Be careful when connecting the Metropolis with the Whimisical Raps – Just Friends RUN input. The RUN jack is normalled to -12V and has been known to damage Metropolis outputs. Make sure to plug a cable into the RUN jack BEFORE plugging into any Metropolis jacks so you break the -12V normal. Updates are downloadable from the Firmware Updates page. Fix a bug introduce in 1.14 that disabled the STEP/DIV function. Fixes and improvements to outgoing clock when using external clock sync. Prevent accidental triggering of slides when muting / unmuting steps. Slider movements / currently played notes now display quantized value. Reset to default settings: Click load, scroll to yes, click reset. Keep pitch constant during rests. This can be reverted to the old behaviour by changing “rPC” (rest pitch) option in config to “yes”. Encoder acceleration when changing BPM. Fix loading of int/ext clock mode from a preset. Fix upgrade of some modules where the clock would run slower than normal. Fixes for incoming clock divider when used with an external clock. Fix upgrade on modules with ATmega328p chips. New d24 option under INT/EXT for tight sync with dinsync devices. New incoming clock divider setting under the div menu, and aux control over clock division. prev/next buttons can be used step between stages when stopped. The currently selected stage’s CV is output so it can be used to preview the note. int/ext clock mode is saved along with the other settings. Copyright (C) 2011 Boutique Pedal NYC. All Rights Reserved.